Bimbo is a tubby, black and white cartoon dog created by Fleischer Studios. He is most well known for his role in the Betty Boop cartoon series, where he featured as Betty's main love interest. A precursor design of Bimbo, originally named Fitz, first appeared in the Out of the Inkwell series. 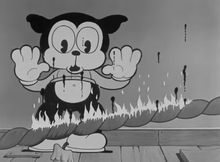 Bimbo later became the protagonist and star of Fleischer's Talkartoons series, positioned as a rival to Disney's Mickey Mouse, making his first named appearance as Bimbo in Hot Dog (1930), though Bimbo's design would not become standardized until around 1931. The name Bimbo was chosen because in the 1920s the word was mostly associated with men who liked to fight. He starred in several famous cartoon shorts of the 1930s, most notably Swing You Sinners!, Minnie the Moocher and Bimbo's Initiation. Bimbo became a less prominent character after his girlfriend Betty Boop gained unexpected stardom and popularity with fans, with the Talkartoons cartoon retooled to give her top billing as the Betty Boop series in 1932. After Hays Code censorship rules began to strictly get enforced in 1934, Bimbo disappeared from future Fleischer cartoons of the era, due to the implications of a anthropomorphic dog dating a human girlfriend being too risqué at the time. About 56 years after his first absence from cartoons, Bimbo made a reappearance in 1989 as a major co-star in the TV special Betty Boop's Hollywood Mystery. Then in First Publishing's 1990 comic Betty Boop's Big Break with more of his original personality intact as a love interest of Betty. He has continued to appear in various Betty Boop merchandise since then and has been reestablished as a mainstay of the series. In 2016 he appeared in Dynamite's Betty Boop comic mini-series as Betty's best friend with a secret crush on her. In 1932, a character created by Walter Lantz Productions, a dog named Pooch the Pup appeared as the star of his own cartoon shorts. Pooch greatly resembled Bimbo's design, and only a few months after Bimbo was removed from his own cartoon 1934, Pooch was redesigned even further to look more reminiscent of his Betty Boop counterpart. ^ "The Walter Lantz Cartune Encyclopedia: 1930". The Walter Lantz Cartune Encyclopedia. Archived from the original on 2011-05-14. Retrieved 2011-04-24. ^ "The Walter Lantz Cartune Encyclopedia: 1933". The Walter Lantz Cartune Encyclopedia. Archived from the original on 2011-05-14. Retrieved 2011-06-03. Wikimedia Commons has media related to Bimbo (animation). This page was last edited on 16 April 2019, at 18:23 (UTC).